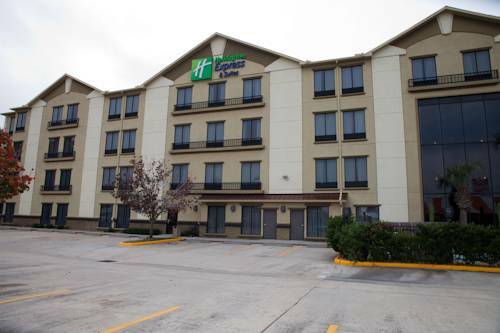 The Holiday Inn Express & Suites Houston North Intercontinental is conveniently located off I-45, only 2 miles North of Greenspoint Mall. Our central location provides easy access to a number of recreational activities and shopping. Cool off at SplashTown Water Park, watch the horses race at Sam Houston Race Track or stroll through all the shops in Old Town Spring. The Woodlands Mall & Riverfront is just a short drive away. The beaches of Galveston Island and the excitement of Downtown Houston are just two places in the Houston area not to miss while visiting. Business travelers will appreciate that we keep you connected with our free wired and wireless high-speed Internet access in our guestrooms, as well as copy and fax services in the 24-hour Business Center. Baker Hughes, Nabors Drilling, Schlumberger, Exterran, Exxon-Mobil and United Airlines are just a few of the companies that call North Houston home. Relax in your own elegant room featuring stylish d cor and amenities. If youre hungry, you can head to one of the many restaurants within walking distance. Enjoy a swim in our crystal-clear outdoor pool and spa or energize in our Fitness Center. Were here, ready with all you need to make your trip to the Houston North-Intercontinental Airport area a success.